French Talmudist; flourished in the second half of the eleventh century. 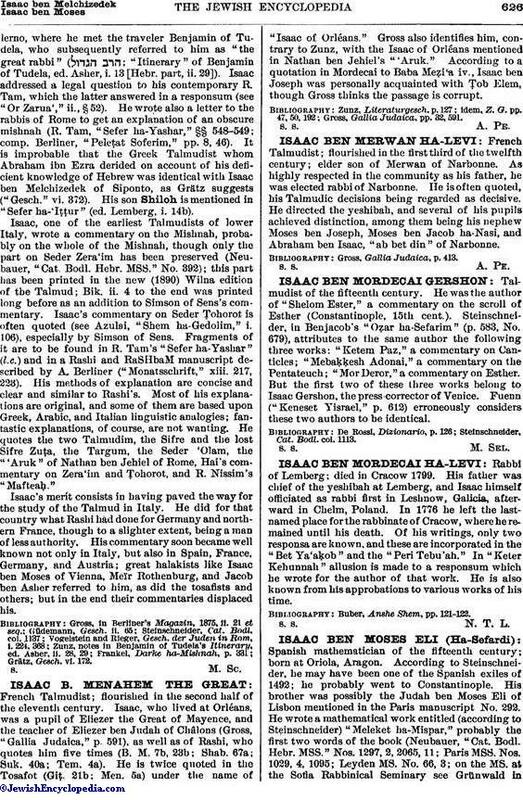 Isaac, who lived at Orléans, was a pupil of Eliezer the Great of Mayence, and the teacher of Eliezer ben Judah of Châlons (Gross, "Gallia Judaica," p. 591), as well as of Rashi, who quotes him five times (B. M. 7b, 23b; Shab. 67a; Suk. 40a; Tem. 4a). He is twice quoted in the Tosafot (Giṭ. 21b; Men. 5a) under the name of "Isaac of Orléans." Gross also identifies him, contrary to Zunz, with the Isaac of Orléans mentioned in Nathan ben Jehiel's "'Aruk." According to a quotation in Mordecai to Baba Meẓi'a iv., Isaac ben Joseph was personally acquainted with Ṭob Elem, though Gross thinks the passage is corrupt. Gross, Gallia Judaica, pp. 32, 591.